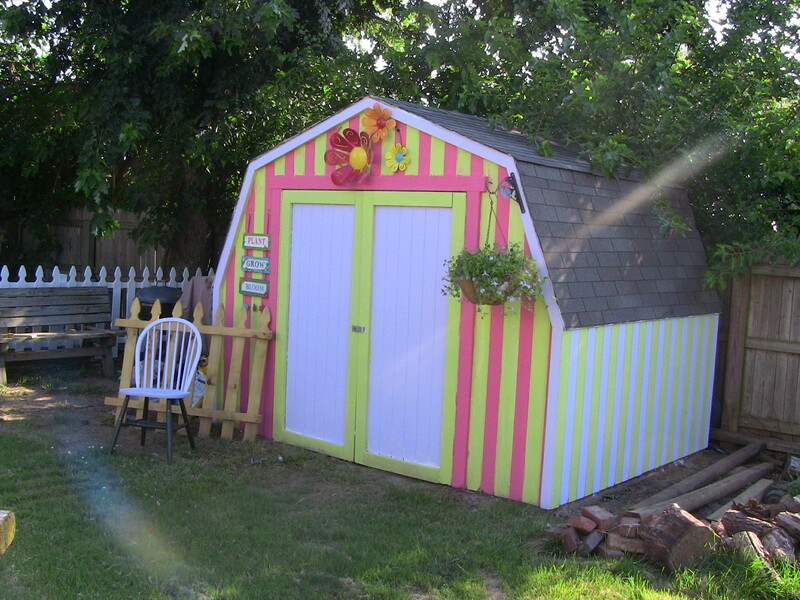 My Garden Shed, she is finished! 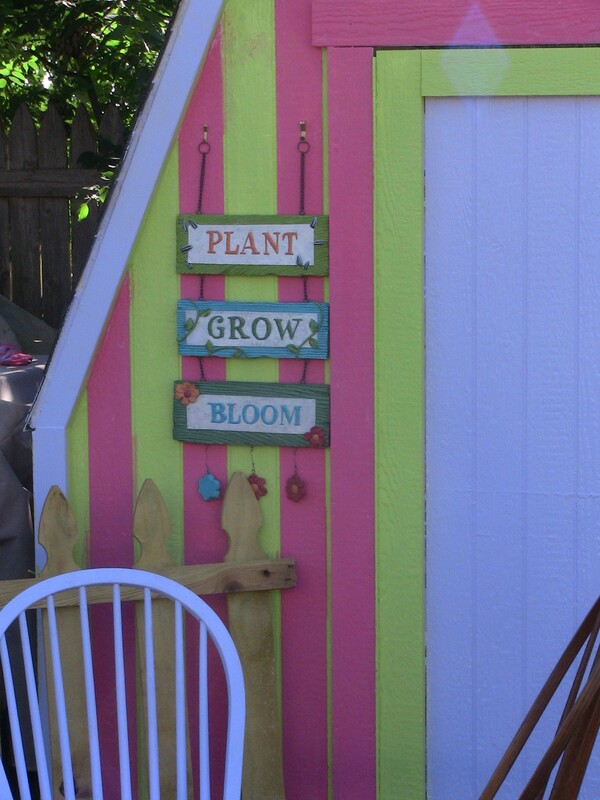 Do you remember a few weeks ago when I blogged about wanting to redo our garden shed? 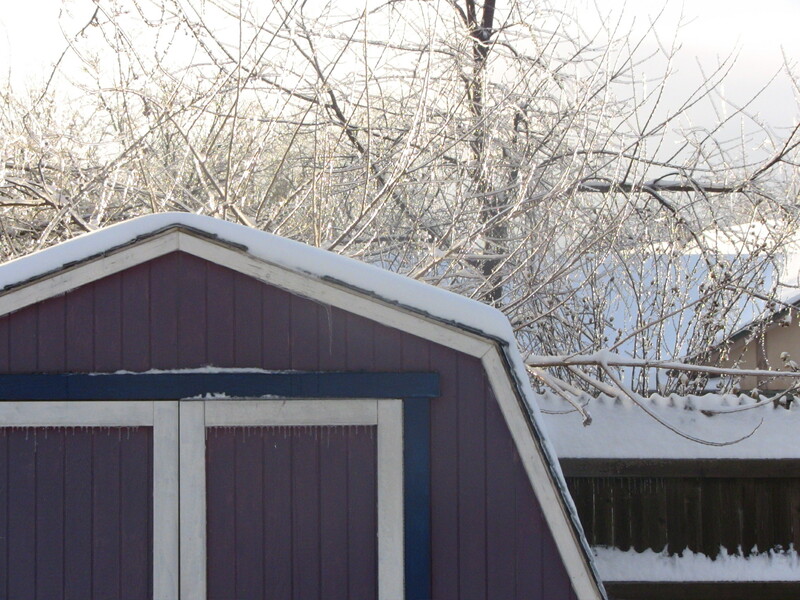 The picture to the left is our shed before we painted it. – I was in a patriotic mood the year we bought that shed and wanted our home to be red, white and blue – a color combination very popular in New England, but not so popular in Oklahoma. I wound up choosing a more color neutral pallet for our house so that it would fit in with our neighborhood that prefers beige to everything else. What worked for the shed was rejected for the main house. I still like the colors, but it is time for a change. And wow – did I change it. Not being able to work in my garden is probably the most difficult part of my recovery from surgery. I love working in my gardens. Something about it is peaceful and comforting. Still, just because I can’t physically work in them doesn’t mean that I cannot plan them.So that’s what I’ve been doing — working through new plans. 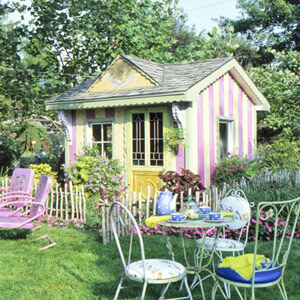 I told you a few days ago about how I was on the Better Homes and Gardens pages and got inspired to redo our garden shed. I thought my husband was going to hold his breath until he turned blue in Home Depot and I still walked out of the store with watermelon, Green Apple, and Lilac paints. I am a blessed woman.My oldest painted and I helped as I could. Yes, DH thinks he deserves canonization for it, but Lutheran’s don’t canonize, so the poor man is out of luck. The metal flowers below were purchased from Lowes Hardware store. If you look closely, we had to use special brackets (purchased separately) at the top of the wire sculpture. The hardware that came with the flowers was not sufficient to attach to the wall. The watermelon color is by Glidden and the green and lilac are Behr. I wanted all three in Behr, but you are not allowed to cross brands. Meaning, I cannot pick up a Glidden color card and ask the Lowes guy to mix it in a non Glidden paint and vice versa. Nothing against Glidden, it’s a great paint, I just prefer Behr for longevity. Having said that, I really like Glidden’s exterior color pallet this year, it’s bright, and very versatile. The watermelon was a little intense, so we used lilac with the green apple on the sides. Side view -- now to go back and add the landscape. So that is my new garden shed. Pretty hunh? Being the only female in my house, I’m pretty much the only one who likes it. My husband has jokingly told me his tools may not be able to live in such a place. And even though he’s not on the same artistic page as I, he does agree this project and these colors have not yet killed him. We still have landscaping to finish. Pea gravel for the front of the doors, some flowers and maybe a rose-bush or two. I have a wisteria that I need to move and will probably put it next to the shed for stability. The white picket fence in the back ground is new as well. My dogs were destroying the fence line and have broken the main gate too many times, which is why we split the yard this year. And that is how I spent my recovery time – blue printing and planning my gardens. I have more to come and as time and the doctor allows, I’ll be busy. Have a great day ya’ll and don’t forget your sun screen. On a side note, I was linked to from Shed Building Master’s Class last week. What a huge compliment. If you want to know more about building your own shed, please be sure to check them out. It’s a really nice and professional looking piece. Not everyone hates Mary. It’s easy to think that sometimes, especially when sitting in a protestant church. Pastors seem afraid to speak of Mary – Mother of Jesus – in a positive light, lest they give the opinion that we are worshipping her. Lutheran pastors are probably the worst in that regard. For those who don’t know me, let me add I am a Lutheran, by marriage, but a Lutheran nonetheless. I don’t want you thinking that I’m picking on Lutherans here because that is not my intent. Most Lutherans are, however, overly cautious on anything that might be perceived as Catholic teaching. And so,they avoid Mary. Mary, as a mother, has always fascinated me. I can’t imagine what she must have been thinking, or how she did the things she did. She was 13, 14 at the most, when Gabriel came to her and offered greetings. WOW — I haven’t really given her much thought lately, until.. A half sheet of paper fell out of a book bag this morning. On it are my notes from a Sunday School class I taught last December. Doesn’t mean much really, except that I taught a class DEFENDING Mary’s title as Mother of God as well as her dignity within our church. My passionate tone, opinions, and facts cover that half page of take home material. I’m not sure what I remember most, the excitement over being allowed to lead the women’s class in December while pastor led the men – or the fact that I got teach on something that resonated so passionately within my spirit. Like I said, Lutherans seem to be afraid of Mary. – Unless you are a Catholic – with a capital “C” Lutheran – and I recently learned that we have a few of those around. It was because of one such local pastor, that I found the courage to dig deeper into Mary’s story. By doing so, I found pieces of my own. I’m looking at my notes today and I see my first point – Mary’s response to Gabriel seems flip, almost a “yeah what do you want” kind of response and why is that? Because Mary knew her history. She wasn’t the first person to “find favor” with the Lord. Abraham, Moses, and King David to name a few also found favor. Having an angel of the Lord appear to you to say “you found favor” means only one thing really; Your life is about to be turned upside down. Go or someone is going to die. Lot to ask of a 13 year old. Lot to ask of a 44 year old. Everywhere I look I see that phrase “Your life is about to be turned inside out – go – or people will die… Will you answer the call? Edited to add: My liturgical studies have ended for now. I will write more about it later, but for now I’d like to leave this thought. There is a difference between capital C, Catholic and small c, catholic; one equals Rome, the other means universal. While I am grateful for the opportunity to dig more deeply into the things of God, I’ve learned that to replace a real relationship with Christ for the things of Christ (a worship service only from the hymnal) is like having a parishioner who mails in their tithe but doesn’t come to church. They’ve done their duty, but nothing more. They are bound by obligation and pride, but not love. Participation Trophies are humiliating, at least that is what THIS blogger says about that. And you know what? I think she’s right. And so do my kids – who have those trophies by the way. They also have trophies they actually EARNED and they like those a lot better. While we (boomers and well wanna be boomers such as myself) lament over what is wrong with the allegedly overly entitled millennials (Gen Yer’s) they in turn lament over our own overly inflated opinion of self. What is interesting to me is while writers and others lament over the way we’ve allegedly spoiled our millennial kids (I have two of them) with participation trophies for sports and science fairs, grades based on perceived ability to achieve as opposed to actual achievement, we too ignore our own shortfalls and I want to know when did failure become a bad word? When my children’s Christian grade school closed, we sought out one of those artsy fartsy country schools for my youngest. We thought it would be good for him to learn at his own pace in a more “open and accepting” environment. This school was so open and accepting (of anyone willing to pay $10k a year) that he wound up repeating the 6th grade when we transferred him to another school the following year. Turns out they grade on perceived ability and being the brilliant child he is – he convinced them he had the IQ of squid and made straight A’s all year while doing little more than breathing in and out. We’re even lied to in church. What with the feel good evangelical movement all around us that sells us a lie that I believe has the potential to condemn us.. The “God doesn’t make junk, therefore I don’t sin anymore” propaganda that some pulpits try to pour down our throats, even within my own synod sometimes. My only question is: If I don’t fail, don’t sin, and gosh darn it people like me, do I really need a savior? Don’t get me wrong, God doesn’t make junk, I’m not junk, some people really DO like me, but I still sin, and I still fail. And I think it’s okay to admit that. And yet — I’m told that if I admit my failings, that I’m beating myself up needlessly. Really? I thought God’s word told us to confess our sins to one another.. To seek forgiveness. To be humble and transparent. I chaired a community egg hunt a few years back. We planned on about 1,000 people and twice that showed up. We were overrun, my volunteers bailed. Teens ran through the crowd and stole most of our eggs (I’m not making that up). Hundred’s of children went without. I had children crying, parents yelling. What was left of my team jumped under the prize tent to split up baskets and hand out what we could to children. 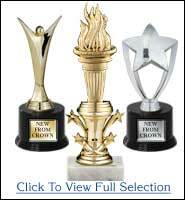 Parents, upset that their child had not received anything yet stole prizes out of our hands. The egg hunt was in my mind a complete disaster. I – as chairman and MC of the Event failed. I learned from it, I know what to do differently now and what went wrong, but I still – in my opinion – failed. Don’t get me wrong, God’s grace covers a multitude of shortcomings yes, and I’m not talking about perfection here – what I am talking about though – is when I die and go to heaven, I don’t want a participation trophy that says “good for you, you tried.” I want those crowns that we’re promised, the ones we get to throw back at the feet of Christ. The ones we cannot get unless we are willing to try, fail, admit we failed, confess, repent, and try again. Oh I failed — miserably. I was ill prepared, over run and terrified of not only the crowd, but the people “above me” who wouldn’t listen to my arguments of location location location. The good news is, I didn’t stay down. I took all of that back to the cross, and picking myself up, dusting myself off, I prayed for teachers, and opportunities to learn how to do better next time. And God answered those prayers with wonderful men and women who came along side me for a season and have taught me great things about ministry, planning, events, speaking, and even comedy. By admitting I failed, I open myself up to more grace and more of God’s hand than I could ever imagine. And yet, so many times, so many of us would rather receive a participation trophy than admit we failed. Why is that? I believe failure becomes a bad word when we don’t own it. When we can’t get past the false shame and confess – truthfully – to God and to eachother that we missed the mark. Why do you think we are afraid of the “F” word? Why are we – our generation – afraid to own it when we fail? I’d love to hear from you. This blog post is written by Deana O’Hara for Redemption’s Heart. All rights reserved. Deana lives in Oklahoma, is a stand up comic, motivational speaker, mother of two highly creative boys and the wife of one awesome musician. THELMA: Before I begin, let me first say, if you and/or a loved one are in a crisis situation and you need immediate assistance, please call your local emergency number or the mental health crisis hotline listed in your local phone book. In your introduction, you state that you’ve been there – you’ve been depressed. Tell us about that. Yes, I have. This story is told in detail in the book, however, I had surgery several years ago and within a few days the incision split open and my intestines were exposed. This was probably by far the worst pain I’ve ever experienced. After a quick trip back to the hospital to repair the damage, I spent over a year bed-ridden, disabled, and recovering. I’m not the kind of person to lie down and take things slow, especially when it’s forced on me. Yet, in this situation I had no choice but to stop and heal. It wasn’t easy and I faced a lot of fears and I experienced situational depressed during this time. Some of us are more prone to depression than others. The influences that bring us down in our spirits can come from many sources and directions. Depression can be a complex picture. But let’s face it. The main reason we get despondent is simply because life happens. And nobody’s life is a constant procession of uplifting, rejuvenating, invigorating experiences. Everybody’s life has downers. We easily get off-balance in so many ways, and this hurts. The TV commercial that says, “Depression hurts” is true. Does your book focus on one type of depression? For most of us, the depression we typically encounter isn’t the severe or clinical category, medically speaking. The typical depression is situational. This doesn’t mean they’re painless or less important or harmless. In your first Chapter, you talk about “Who get’s depressed?” Does depression affect certain groups of people more than others? Every year depression strikes more than 35 million in the United States alone. We’re seeing depression with frightening regularity in ourselves, our relatives, and our friends. Dr. Harts states, “There is hardly a family today that is not touched by depression’s tentacles.” Depression affects people of all social classes, all races, and all cultures, but there’s one group that’s especially hard hit…women. Also there is an alarming increase in children and the elderly. What are the triggers and causes of depression? Psychology Information Online, which includes content provided by the National Institute on Mental Health, notes that “a depressive episode” can be triggered by “a serious loss, chronic illness, relationship problems, work stress, family crisis, financial setback, or any unwelcome life change.” Sometimes depression is brought on by an underlying disease or biochemical disorder. Whatever the cause of our depression, it needs to be faced and understood realistically—and then accepted for what it truly is. Does the Bible speak about depression? It does in several places and we see it in the lives of David, Jeremiah, and Paul. Psalms 42 and 43 together represent the cry of a downcast soul—someone who is hurting and thirsting for God. Paul describes our loving Father as “God, who comforts the downcast” (2 Corinthians 7:6). Christians do get depressed, but it’s a temporary state. God allows us to experience it as a means to attaining something better. Our hope and contentment are based on seeing our past and present difficulties as gifts from God to prepare us and enable us to do more for Him by sharing Christ, finding delight in God and what He ordains. What are the steps you outline for “Doing something about it.” And why are these important? Get It All Out – talk to somebody about how you’re feeling. Emotionally and mentally, talking about your feelings is a healthy thing to do. Everybody needs somebody to confide in. That’s right. Everybody. Take Care of Yourself Physically – How healthy we are physically always impacts our mental, emotional, and spiritual health. Don’t be Deceived – Your emotions can fool you into questioning or not knowing what’s real or not real. Depression can cause some strange symptoms. You’re Your Own Captive Audience – People talk to themselves. We all do it. When we talk to ourselves, we need to watch what we’re saying. You see, when we talk to ourselves, we invoke our consciousness. And in our conscious awareness, we truly hear what we say. Our subconscious hearts it—and believes it! Then our creative self-conscious gets busy working it out…whether or not it’s true, real, positive, negative, or healthy. Hope is a key word used throughout the book, but especially in the last chapter. What does the mystery of hope mean? From page 99 to page 109, I discuss the facets of hope that we can attain when we refocus our attention from us to God. Our living hope is not in things, people’s opinions, positions, status, or any tangible findings of life. No, it rests upon the spiritual and emotional stability of our minds on the only wise God, our Father, who can help us in our depressed states every day. This living hope is in Jesus, the Anointed One, whose job it is to redeem us for all things that oppress us. The only hope for the world is Jesus. The only help for the world is a touch from God. You spend a whole chapter on “Looking Outward.” Why is this important? At the risk of bursting someone’s bubble…the world doesn’t revolve around you. I know you might have thought it did. I used to think the same thing about me. One of the best ways to deal with depression is to do something for somebody without expecting anything in return. Search for a volunteer organization, mentor a child or young person, or find someone who needs help with something and help them. Do something. That’s the key. I have several activities available via my ministry that offer opportunities to people to connect with others. Join me on excursions across the country and to Israel studying the Word, relaxing, rejuvenating and enjoying the life God has given us. We are also launching the Ready to Win Web Cast University with a variety of experts to offer you the best in Christian instruction, study, and education. 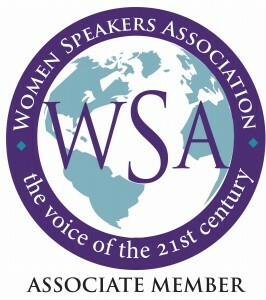 I have hand selected several outstanding speakers that will enable you to be READY TO WIN in every situation. Both of these and more are available on my web site at www.ThelmaWells.com. How is the book different from others? This book is different from others because it gives the reader a non-threatening opportunity to ask themselves questions and answer those questions in the book as they are reading it. It is not a course of study; it is a means of helping them “get it out.” It allows them to analyze their state of being and work through it alone so that it is there personal and confidential analysis and directives for healing. What results do you see that can come from reading this book? People have a handy reference at their fingertips for calling their attention to what they are facing in terms of situational depression. People have at their fingertips information that they can share with others who may be experienced the same kind of depression. There are reminders in the book that are encouraging and inspiring that can be used as a devotional. There are stories that people can relate to and realize that they are not alone and there is always help. How do you see individuals, small groups and even churches using this book? Not only is the book appropriate for individuals, it is designed for group work for small and large study sessions. Because it is a simple lay-out and intentionally open-ended, it can be used as a guide for therapists with their clients, ladies groups of any kind, church groups, Sunday School classes, Bible studies, or references for children’s groups that are concerned about situational depression in our children. Where connect with you further on this topic? Or, purchase a copy of this book? I would love for them to visit my web site at www.ThelmaWells.com, browse through the various events and other resources available, as well as sign up for my mailing list. READY TO WIN OVER DEPRESSION is also available online and at local bookstores such as, Family Christian Stores, Lifeway Christian Stores, Amazon.com, Barnes and Noble Book Stores, Mardel’s, Anchor Distributors, Christianbook.com, and many other stores and vendors throughout American and the United Kingdom. I would also like to connect with people on the new Facebook page we set up specifically for this topic at www.facebook.com/readytowinoverdepression. Or they can find me on Twitter at www.Twitter.com/Thelmaw. Again, let me say…if you or someone you know is dealing with depression, you are not crazy. God knows you’re not crazy. And He also has a perfect antidote for your depression. Nothing escapes Him, and he knows you far better than you know yourself. Isn’t that a relief and comfort? A complimentary copy of this book was provided to me as a blog tour host by the author in exchange for posting this interview on my blog. Please visit Christian Speaker Services at www.ChristianSpeakerServices.com for more information about blog tour management services. 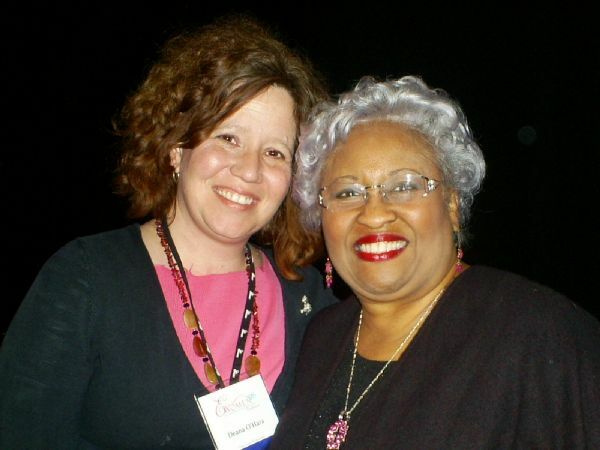 I had the amazing privilege of being a hostess for nationally known speaker Thelma Wells at an E-Women conference not that long ago. Having seen Thelma speak at Women of Faith for years, I have to admit I was little intimidated. Something interesting happened the weekend I met Thelma – her mothering spirit met my daughter’s heart and it took everything I had to remember I was there to serve and not be served and not just crawl into her lap for the weekend like I wanted. Thelma is warm, kind, inspiring and insightful. Hosting Thelma for this blog tour, is an honor and a privilege. I will post her interview on Saturday, June 12, but for now I’d like you to know a little bit about her newest book and about her. From times of singing in a dark closet to the founding of a national women’s mentoring ministry, Thelma Wells’ life has been a courageous journey of faith. The name on her birth certificate read simply: Baby Girl Morris. Thelma’s mother was a severely deformed teenager with no husband and no place to go, since her own abusive mother insisted that she take the baby and leave the house. So when the baby was born, her unwed teenage mother found work as a maid cleaning “the big house” while living with her baby daughter in servants’ quarters. Eventually, the baby went to live with her great-grandparents, who called her Thelma Louise Smith and loved her dearly. They took little Thelma to church, where she learned to love the hymns and praise songs. Word to the wise: When planning out your gardening ideas, it is sometimes best to not let your husband see you on the Better Homes and Gardens Web pages. He saw this photo and almost had a stroke. 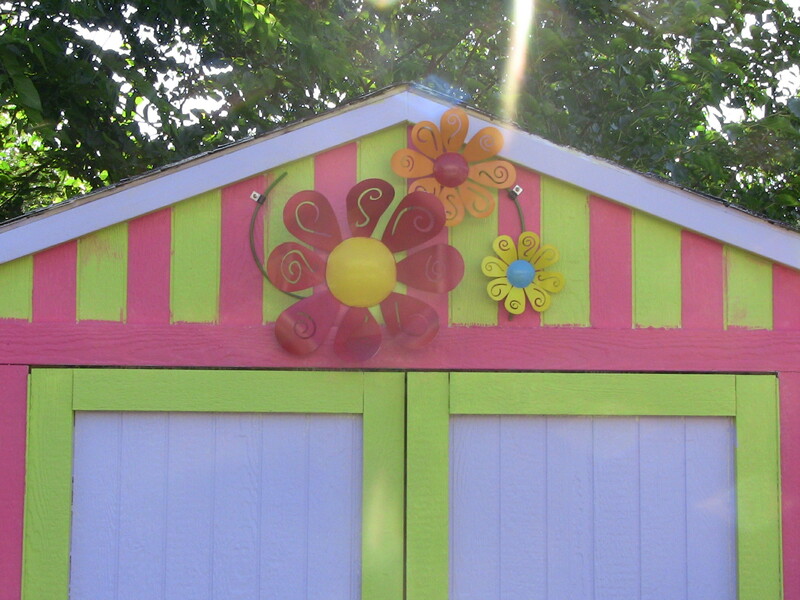 We are painting our shed and I did pick out some less than traditional colors like watermellon, lilac, and green apple. I think it’ll look great. DH isn’t so sure. He say’s his power tools will need a new place to live. I think he’s exagerating just a little – but you never know. In the mean time, DH is trying to find a way to block Better Homes and Gardens from our computer. High Fives or Low Digs? Them: – How’s the no smoking thing going? Me: Guess what, I quit smoking! Them: Well it’s about damn time! I wonder who I’m going to share my victories with next time? What kind of empathic communicator are you? Do you high five or dig low?